For this review I used the the RODE NT1a (Michael Joly Mod) microphone on voice and acoustic guitar. 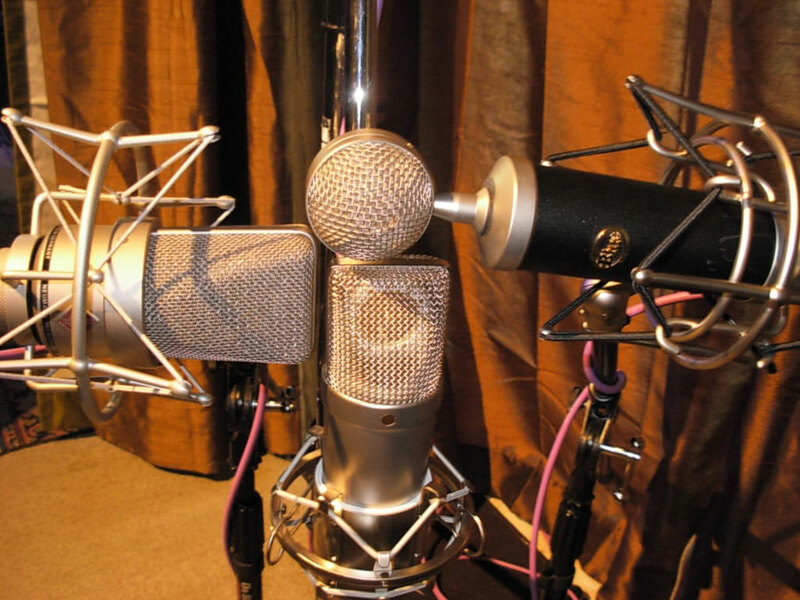 Test equipment included a Neumann TLM 103 and a Blue Baby Bottle (as comparison microphones), along with a Focusrite Liquid Saffire 56 (the Liquid Pre channels were not used) and Canare microphone cables. All files were recorded at 24-bit/48kHz with no EQ or compression. I did do some very slight gain adjustment, just to be sure that the volume of the reference files played back as closely as possible. The Michael Joly (www.oktavamod.com) RØDE NT1-A modification is quite a popular modification, and at its price point, I feel it is a great option for any home studio looking for an excellent general-purpose LDC to have in the locker. It is an outstanding addition to any project or large studio’s arsenal as well. 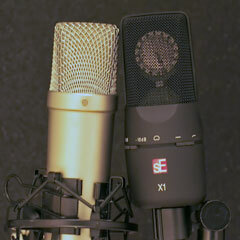 If you have read about the RODE NT1a (Michael Joly Mod), you will know that it is described as a Neumann U87 alternative (a shootout between the two microphones is available on the OktavaMod website). Though I believe this summary is a great way to reference the sonic characteristics of this microphone, for this review I wanted to use two other microphones that were roughly in the same price range for comparison. The RODE NT1a (Michael Joly Mod) can be purchased from the OktavaMod website for $629 (the mod is available separately for $399). The TLM 103 can be found for approximately $1100, and the the Blue Baby bottle is right in the $400 range. For our sonic source material, I was fortunate to have the very talented multi instrumentalist Brian Rodgers, of the band Izabella come by the studio, Green Robe Recording, to perform on acoustic guitar and vocal. For the review Brian performed part of his song entitled Relle Belle. After tracking guitar and vocals separately for the review, we went ahead and recorded a full version of this song using the RODE NT1a (Michael Joly Mod) for both the acoustic and vocal (once again, tracked separately in the same positions as the review clips). You can find the whole track at the end of the review. 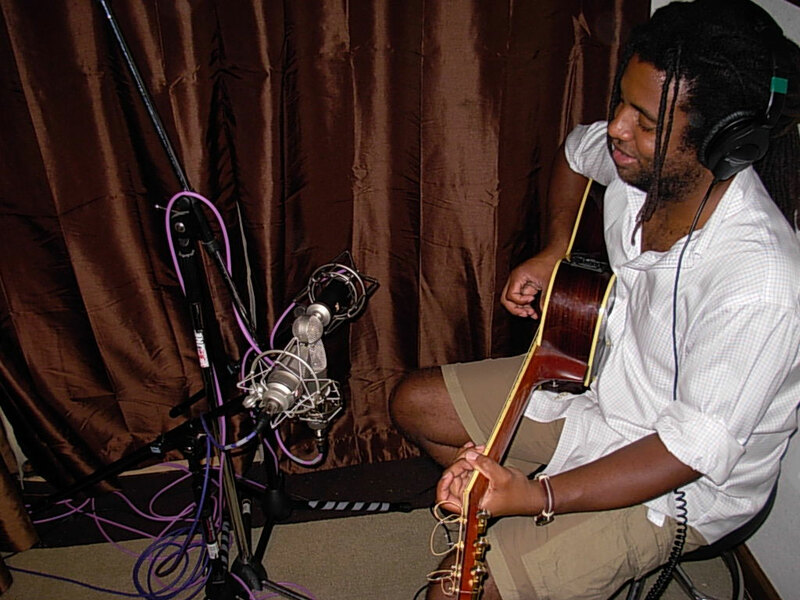 For both voice and acoustic guitar, we tracked in the back of my control room which when curtained off is 6'x7'x9'. This area is treated, but not entirely “dead.” For acoustic guitar I set up all three microphones at a distance of approximately 13.5'' from the 12th fret of the acoustic guitar. 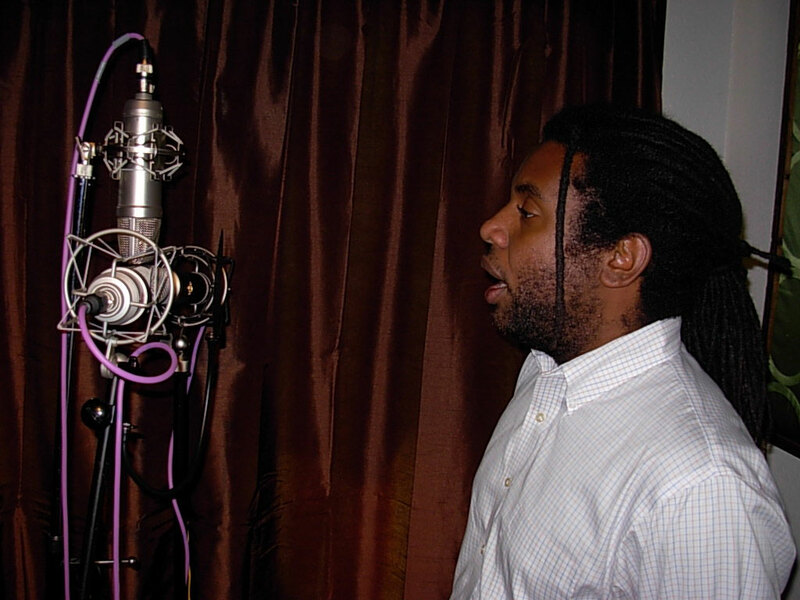 The tracks you will hear are the same performance captured on three microphones at once. 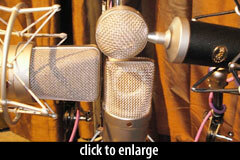 I found all three microphone preformed quite well, and though the differences were not huge, they are significant. Depending if the acoustic guitar part was being tracked for a large or small production, I would make different microphone selections based on what I have heard here. Acoustic guitar Sample A is the Neumann TLM 103. On this guitar, the TLM103 had very rich low mids, and it seemed “grab” the string noise. I also found the top end to be bright yet not brittle. I use this mic often on acoustic guitars and find it to be a true workhorse in the studio. If I were tracking for a large full-band rock production, I believe this is the mic that I would choose, as the top end is already there to help it stand out in a full mix. Acoustic guitar Sample B is the Blue Microphones Baby Bottle. I agree with Brian’s statement above, and found this mic to be lacking a bit in the mids (in comparison to the other microphones), and it seems as though the highs are a bit pronounced and crisp around the 5–6k range, though this is still a very useful mic on acoustic, and I would probably try it first when recording a Baby Taylor or Parlor Acoustic guitar. Acoustic guitar Sample C is the RØDE NT1-A (Michael Joly Mod). As stated previously this is my top choice from this three-mic selection. 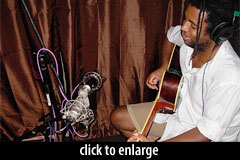 I find this mic to sound true, flat and natural on the acoustic guitar. If I were doing a folk/acoustic song or singer-songwriter with minimal production, this would be my go-to choice. In the same location where we tracked the acoustic, I raised up the microphones, and set them up to all capture Brian’s vocal performance. Brian sang from approximately 11'' away from the microphones. The tracks you will hear are the same vocal performance captured on on three microphones at once. Scroll down to find out which is which. All the microphones performed quite well. I do use all three of these mics on vocals, and my choice is always dependent on the timbre and quality of the singer’s voice. Vocal Sample A is: the Blue Microphones Baby Bottle. In this clip you can clearly hear the Baby Bottle’s dip and boost (dipping around 1500 Hz and a slight boost around 5kHz). If I were to use this on Brian’s voice, I would need to experiment with placement, as I found the sibilance was a tad much, and that the high end wasn’t as “open” as what I would like on a lead vocal. That being said, the mids are clean and smooth and there was nothing lacking. 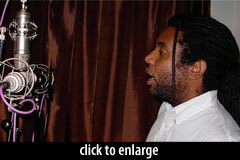 I have had great success with this mic on male singers who have a higher register or who are singing falsetto. Vocal Sample B is: the RØDE NT1-A (Michael Joly Mod). My “quick Choice” again. To my ear, this mic is very flat and natural sounding. Though it may not be my first choice for all vocals, if I were tracking a strong vocalist who has good mic technique and can enunciate well, this would clearly be an excellent mic to select. The top is open and the highs/high-mids are smooth. I am very impressed by this mic. Fortunately Brian is a great vocalist, and for a production of just guitar and his voice this would be my choice. 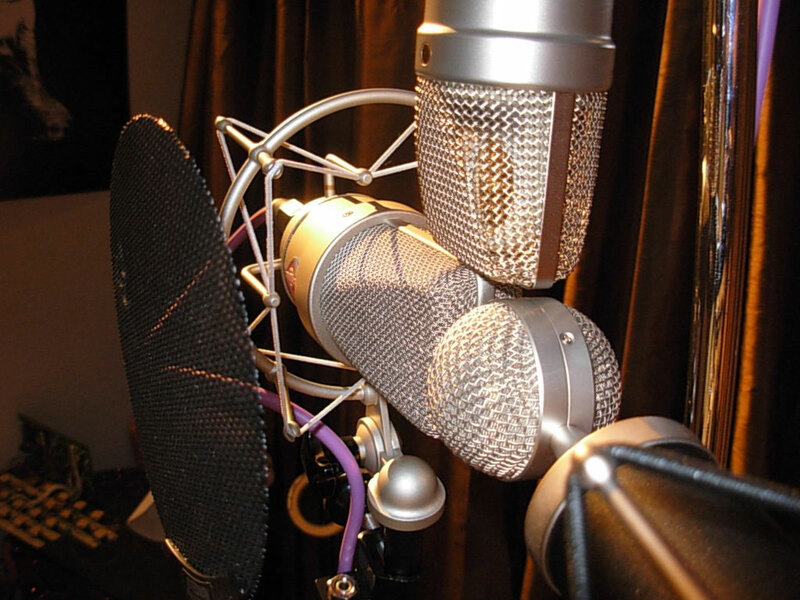 Vocal Sample C is: the Neumann TLM 103. 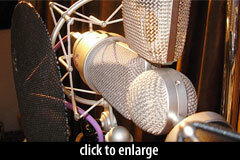 I feel that the TLM 103 is one of the best vocal microphones in its price range. It really does so well on so many different types of vocalists; it is hard to go wrong with this mic. In this clip you can hear how its bright and open top end really help to add definition and clarity to each word. If I were tracking a pop or rock song with a lot of program material, I might grab this mic first, just to get that quality top end recorded, so there would be less need to EQ later. The RODE NT1a (Michael Joly Mod) is a awesome addition to my mic locker, and for someone who is looking for a great workhorse LDC, I definitely would recommend it. 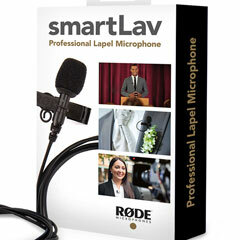 If you are on a budget, this mic might be a great way to build up the quality of your mic locker. Just buy a RODE NT1, and while saving up for the mod, use it as is. One of many bonuses to having modded microphones in your locker is getting a “flavor” or “character” that is unique and affordable. It is very cool to own a mic that is non-standard, for you know that you have a mic the few other people in the world do. Ordering with Michael is a breeze. His customer support is top notch, and his work is impeccable. I personally have been a huge fan of Mike Joly’s work for over a decade, and this mod further instills my confidence in what he can do. The only thing thing that makes this mic better is getting the matched pair, which I did! Here is the whole song Relle Belle. Please enjoy! It is no secret that we are fans and customers of OktavaMod. You can find more information about the numerous OktavaMod modifications within the Microphone Database. And you can hear the OktavaMod MK-012 all over this site: in our Beyerdynamic MC-930 review, our Oktava Figure-8 Capsule review, and Neumann KM88 Mid-Side Guitar Shootout that took place on The Microphone Show, to name just three of many! I really dig that song. I think that Focusrite interface pre-amp made this mics sounds worse. All 3 mics sounds lifeless and a lot of noise. We need a real pre-amp to make this tests and get better results. The TLM 103 is my favorite on guitar (it sounds more open, has greater clarity) and my least favorite on voice (too piercing). On voice, I like the modded NT1A best: the Baby Bottle has slightly greater clarity while still being smooth, but the modded NT1A is smoother and has … I hate myself for using that word: more “vibe.” To put it simply, I found myself responding to the song sample, rather than just listening to it. Darn it, I picked the TLM 103 every time – the other 2 were too close to each other – I could hear the difference, but there was more there in the TLM – but, the other two were lovely and smooth, and perfect for this song – I’m not on my usual headphones, so I reserve the right to be completely wrong and change my mind. I like these blind tests …. I preferred the Rode in both cases. I own a Baby Bottle..hmmm.. I cared lest for it both cases. On my I-Mac speakers the Rode and the Neumann were very similar sounding (both rich in lo mids + bottom even on this small speaker), I’m sure they’re not price wise. What I’d like to hear is a non-modded Rode next to the modded Rode. Does the mod make all the difference? I have to admit, I’m a big fan of Mike Joly’s mods. I bought the Rode NT1a and was less than impressed with it, so I sent it to Mike. It is now my go to mic for voice. In fact, I now have 3 of these modded microphones. My next Joly mic will be the a modded MXL 990, it’s a mic that sits in the back of my mic closet because it just doesn’t sound great, but I know, once Mike is done with it, it will join the rest of the lineup in the studio. And I’ll second his customer service, out-freakin-standing. He’s right there if you have a question and stands behind his work 100%. I’ve got a Rode NT1 (original NT1, not the NT1A), and I’ve been doing a bit of research on the U87 mod that can be done. I understand the Michael Joly does a good mod on these, most significantly replacing the capsule and headbasket. Now I am sure that it’s great work, but I am a DIY diehard, and would rather have the satisfaction of learning how to work on these myself. I have decided on either the RK-47 capsule from microphone-parts.com or the Peluso P-K47 capsule. I’m still not certain on which would be the best bang for the buck there, as the Peluso is over 100 dollars more expensive. Through my research, I understand the Jim Williams designed these mics, specifically, the NT1 uses really high-quality electronics, more so than the NT1A’s. When Rode decided they needed to increase profit, they decreased produciton costs by using cheaper, surface-mount components, unlike the through-hole design of the NT1. My biggest head-scratcher is finding a headbasket for this mic with a more open design. I just can’t seem to find anyone making replacement or modded versions of headbaskets. It sounds as though Michael Joly has found someone to make these, but I’m wondering if anyone has a lead that I might be able to follow. I understand one of the design flaws of this mic is the tight-weaved nature of the headbasket mesh as it nears the body of the mic. I’m looking for something that stays more open. I know it has been suggested to remove the inner-mesh, but I’m looking for something more along the ‘Joly’ line, with replacing the entire headbasket. I would absolutely love to hear a comparison between the NT1A mod and the original NT1A. While I agree, the mod sounds pretty damn good, I’d love to hear it compared with the non-modded version. Just to hear what kind of a difference the mod makes. I googled for Oktavamod’s address and what came up was a now obsolete mailing address, two 1/2 years old. After 9 attempts I finally got a “too late” response from Joly which was essentially, “tough luck”…and no response on a refund request. OK, i made a mistake i suppose but if he can treat me, a returning customer, this way he can do it to ANYONE. @Doug, I’m sorry to hear that you had a bad experience. But it doesn’t sound like OktavaMod ever received your mic? Seems sort of unfair to blame them if the mic never showed up. I have 2 Focusrite Pro40s..a TLM 103, & NT1a.. and I can attest that the noise in this clip is NOT due to the interface/conversion. The preamps in the Saffire Pro 40 are solid, super clean, bunch of headroom (except on ribbon mics, but even maxed out its still pretty clean) I also have Universal Audio ad/da and while the sound is wider, bigger, more focused.. the Focusrite holds it own. So the noise in this clip is probably due to other factors like mp3 compression. All I know is that my recordings with these products are incredibly noise free. Both 1 and 2 were close in terms of how much I liked them both but #3 was a distant third for me. It was just sort of blah. I have a stock NT1 that I’ve been thinking about having modded. I think I’m going to just do it.